An advanced lightweight Structural Fire Protection (SFP) system is used throughout Incat vessels. Significant features of the SFP include its water resistance, robustness, ease of installation and rapid removal allowing access to vessel services behind. SFP, form the best fire protection system available for high speed aluminium vessels. Environmental issues are a focal consideration at Incat. As an example; Incat has achieved the world’s most stringent ‘low noise emissions’ standards, through a series of engine room innovations, reducing machinery noise whilst the ship is alongside and ensuring interior noise levels are well below recommended limits. Wash and fuel consumption for Incat ships are improved by the design features of maximum waterline length, shallow draft, weight minimisation, fine bow shapes and shallow transom immersion. Incat vessels are built using marine grade aluminium which is one third the weight of steel. After application of design factors the actual weight of an aluminium vessel will be approximately half that for steel. Aluminium is lightweight without sacrificing strength, allowing increased fuel savings and safety. Aluminium is resilient and tough and has exceptional dent resistance, contributing to seaworthiness and safety. 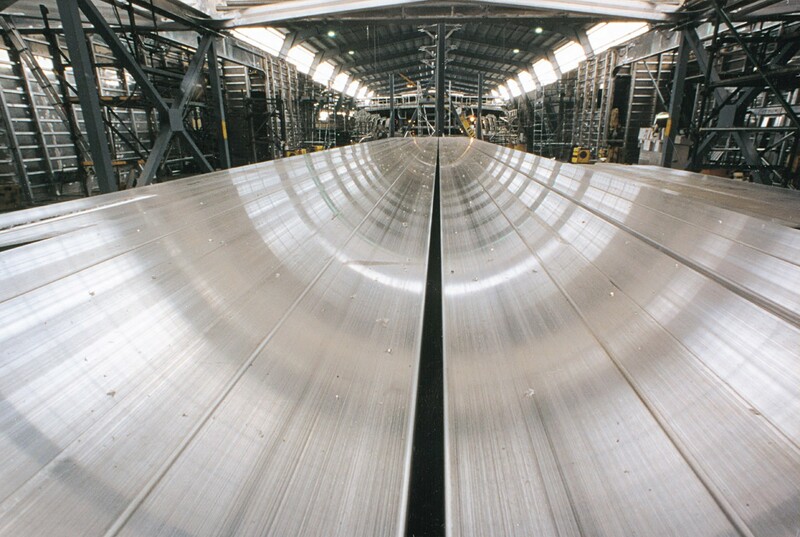 Maintenance costs and overhaul time are less for aluminium vessels than steel due to their high corrosion resistance. Aluminium does not burn; there is some loss of strength at elevated temperatures, where aluminium ranks second only to steel. Aluminum is also non-sparking and non-magnetic which is of benefit for military minesweeping operations. Continued operation of the original Incat vessels, now over some thirty years old, is testament to the corrosion resistance, durability and strength of aluminium. 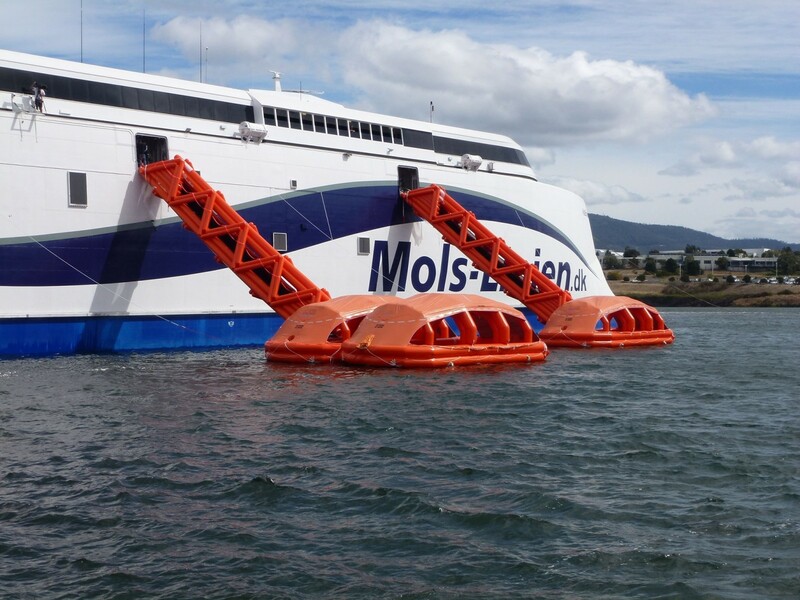 Liferaft Systems Australia (LSA) in conjunction with Incat, has developed a revolutionary Marine Evacuation System (MES) which is now fitted to every large Incat vessel. The system, proven under international scrutiny, is the safest and most advanced MES in the world. Each MES installed can be operated individually by a single crew member or alternatively, the ship’s entire MES can be activated from the bridge. A significant safety feature incorporated into the MES is that when deployed, the Liferaft (connected to the ship by an inclined inflatable slide) is securely positioned and angled away from the hull of the ship, as opposed to alongside. 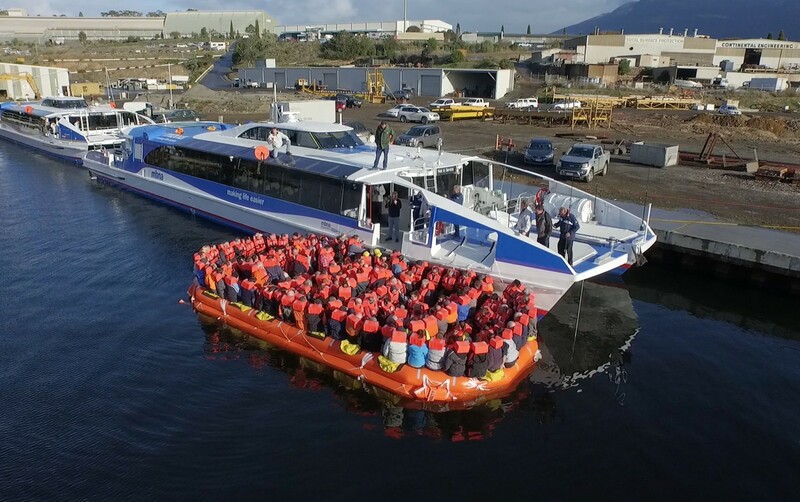 An additional safety feature of the LSA MES is that it is the only evacuation system available which is approved as a Means of Rescue, by having the capability of retrieving passengers from the sea in a rescue situation. Installation of LSA MES ensures that one crew member can supervise the safe evacuation of 100 people in less than four minutes, well within the International Maritime Organisation (IMO) requirements.